Ok, let me confess. I can’t take full credit for this recipe. I don’t make other people’s recipes often, I prefer to experiment, and my mantra is something to the tune of Alyah…”if at first you don’t succeed, pick yourself up and try again, try again”…now just imagine me singing that totally off key, because I couldn’t carry a tune if my life depended on it. …when I saw Alexandra’s post on Instagram, it drew me in and I went straight to her blog, In My Bowl, to check out the recipe. You should totally do the same because her blog is awesome. I found out about it on Food52 a few months back. We entered some of the same contests and her recipes always caught my eye. These donuts were no exception. The recipe is delightfully simple, approachable, called for very few ingredients, and frankly she had me at chocolate and coconut. I knew it would be the perfect treat for hubby as these are two of his favourite dessert ingredients. I adapted her recipe ever so slightly to work with what I had on hand. 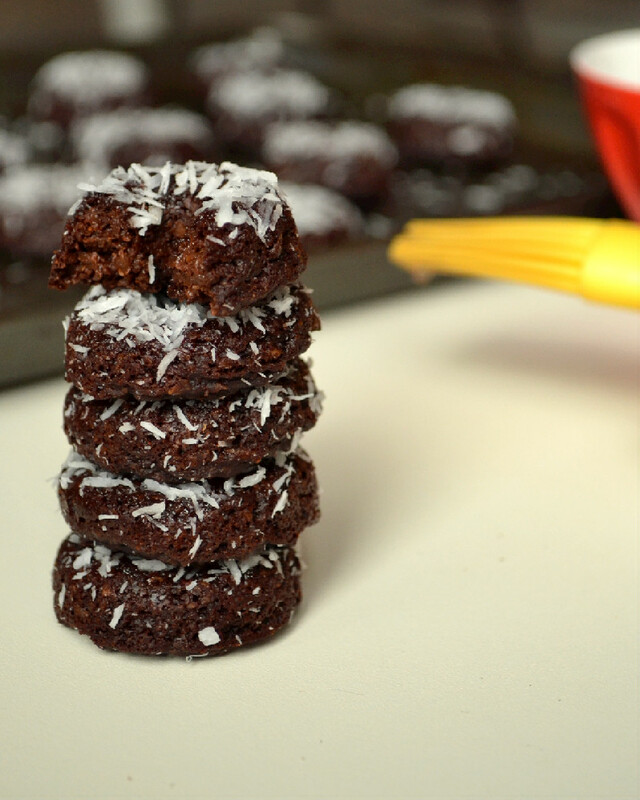 The result is a deliciously fudgy coconutty treat that won’t weigh you down. You’ll have a hard time eating just one. Thankfully they’re a mini two bite size (or one bite, it’s all up to you), so go ahead and pop two (or three). You can find the original recipe here or you can try my modified version below. Better yet, try both, it’s really that simple and your sweet tooth will thank you. Recipe adapted from In My Bowl. Photography by Nissrine @ Harmony a la Carte. 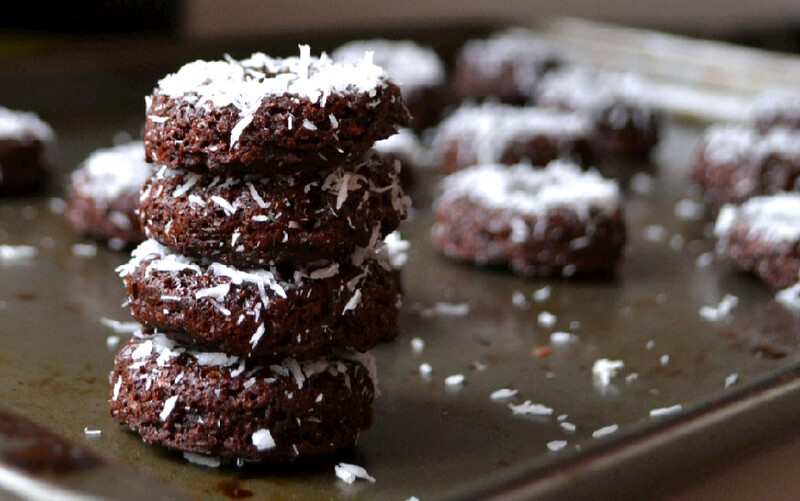 These mini Chocolate & Coconut Donuts are lighter and healthier than traditional donuts without sacrificing the rich chocolatey taste you expect. Made with protein rich ground oats, pure cacao powder, and spiked with the goodness of chia seeds. A perfect treat to satisfy your sweet tooth without compromising your health. Preheat oven to 180 C (350 F) and grease donut/bundt cake pans or tins (I used mini donut and bundt cake pans, but you could also make full size donuts if you like). Combine coconut milk, milled chia seeds and apple cider vinegar in a medium size mixing bowl and let stand for about 10 minutes until it starts to gel. Add quick cooking oats to a food processor and pulse into a fine flour. Combine oats, cacao powder, baking powder, baking soda, cinnamon and coconut sugar in a large mixing bowl and stir together. Add apple sauce and sunflower oil to the chia seed gel and mix to combine. Use a piping bag to transfer mixture into the tins. Bake for 12-15 minutes (bake time may vary depending on your oven). Remove from oven and let them cool long enough so that you can handle them, about 10 minutes. Remove from pans/tins by flipping the tins upside down and tapping them gently. If the pans/tins are well greased, the donuts should slide out easily and intact. Brush tops with brown rice syrup while still warm and top with shredded coconut. Oh my goodness these look fantastic! Thanks darling! They were a breeze to make and quite tasty. 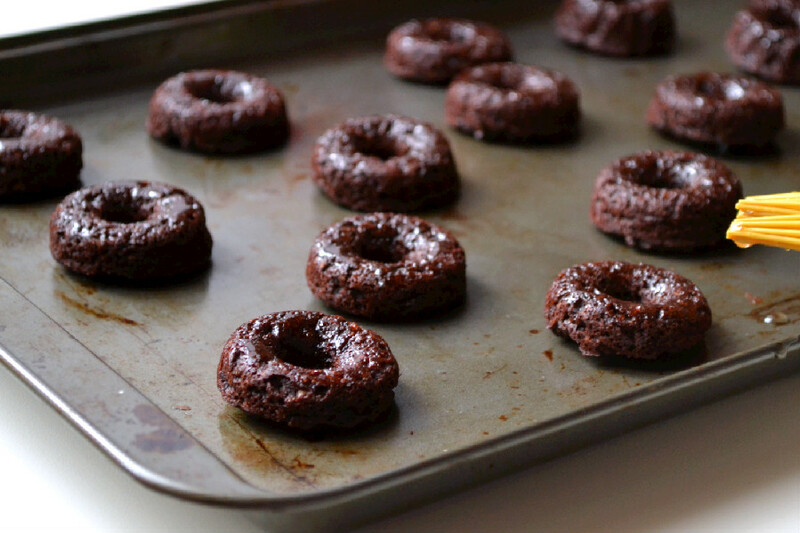 These look so fabulous and chocolatey and relatively simple, which I love!! Love the addition of coconut and cinnamon…yum!! !